For the second time Porsche allocates a funding total of 200,000 Euro for the Porsche Mobil 1 Supercup. Porsche Motorsport had eight race drivers from seven international one-make cups compete against each other in the new Porsche 911 GT3 Cup at the racetrack Motorsportarena Oschersleben (Germany) in order to determine the winner of the 2014 Porsche Motorsport International Cup Scholarship. Over two days, the successful brand trophy pilots had to set not only the fastest possible lap times on the 3.7 kilometre race track but also demonstrate their technical understanding and analytical skills in setting up the 460 hp GT race car. 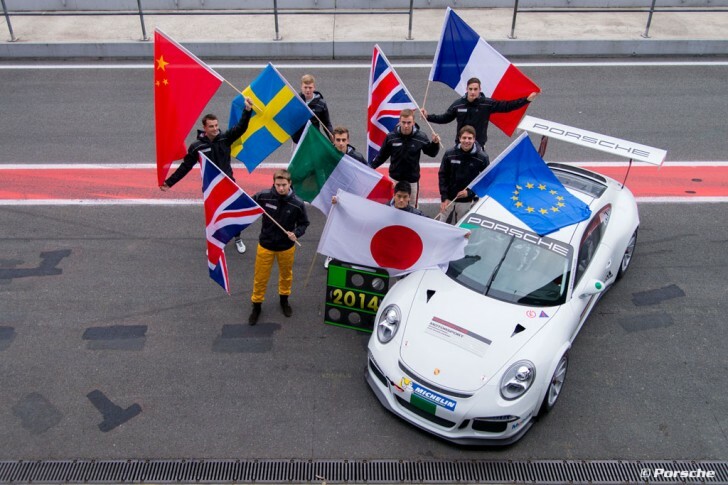 This year marks the second time that the Porsche Motorsport International Cup Scholarship will be awarded. Already at a club sport level, talented youngsters have the chance to impress and advance into the GT3 Cup Challenges or the Porsche Carrera Cups contested around the globe, where they learn everything they need for a career as a racing professional. By way of the next stage, the Porsche Mobil 1 Supercup as the crown of the Porsche one make cups, a number of pilots have succeeded in switching to international GT and prototype racing series. Several of them represent Porsche worldwide as works drivers in major race series.